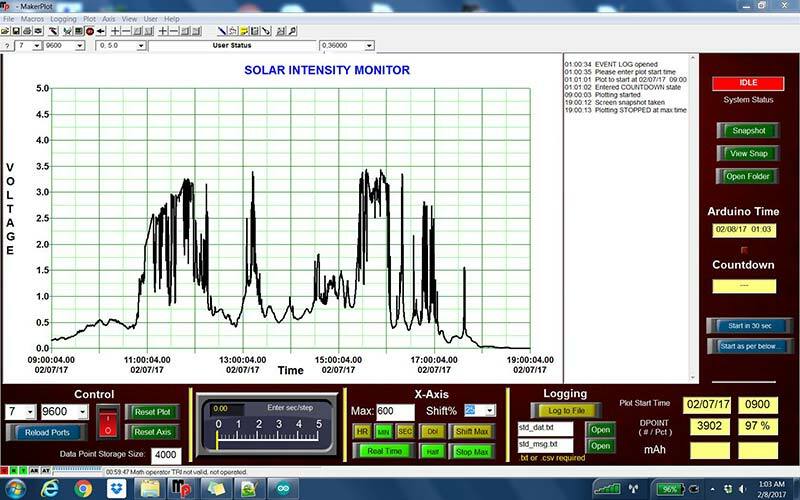 The system described here generates a plot of solar intensity on a PC monitor over the period of a 10 hour day. It can be armed to start the plot at any specified future time. MakerPlot (data acquisition and graphical plotting software for microcontrollers) replaces the Arduino built-in text based serial monitor with a visually interesting display of graphical components consisting of meters, switches, and text/numeric display fields. Data collected is preserved for further study both graphically (automatic plot screen captures) and in text based log files. We'll discuss significant tutorial Arduino/MakerPlot interaction aspects, as well as hints to bypass delays or bugs in future development or enhancement activity. This simple project actually ignores a lot of MakerPlot’s capability. It's aimed at the reader who is interested in how Arduino code and MakerPlot functionality can interact, and what the result might look like in the context of a simple working project. Applying a data acquisition system (DAQ) to record sunlight intensity throughout the day makes perfect sense to me. Required hardware is minimal, and working through the related software challenges is a great learning experience. I first considered using the standard Arduino serial monitor as my user interface, but the MakerPlot package as an alternate approach provides a much more visually interesting display capability. Plus, MakerPlot can provide Real Time Clock (RTC) services to the Arduino microcontroller, which is an important requirement for implementing the sort of scheduling functionally envisioned for this project. The hardware and software described here comprise a small real time DAQ that currently measures and plots sunlight intensity over a period of time. Instead of sunlight intensity, the system could plot anything that can be converted to a 0-5 VDC signal level for the Arduino Uno’s analog inputs (for example, greenhouse light levels and/or temperature, aquarium temperature, weather station data, or even the RPM of a hamster’s exercise wheel!). Although only one analog variable is tracked in the current application, expansion up to 10 is trivial. Digital on/off data can also be plotted. The Arduino/MakerPlot/Time library package described here is a perfect platform to collect data from or otherwise monitor the behavior of small laboratory projects. Besides creating a 10 hour profile plot of sunlight intensity, I wanted the application to provide a means to set up the next day data collection start time the night before, and then have it capture the required solar intensity data for the desired 10 hour period without any further attention from me. After the plot start time is entered, a numeric display field shows remaining minutes in the countdown period until plot start. 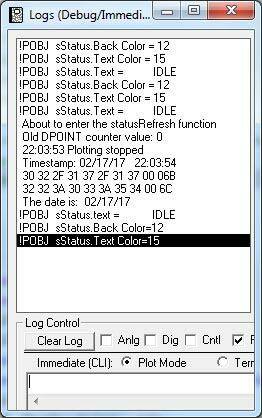 The application captures a jpg image of the data plot and Event Log, and saves it to the PC’s hard drive prior to shutting down at the end of the plot period. A collection of recent 10 hour plots can be seen in Figure 1. FIGURE 1. 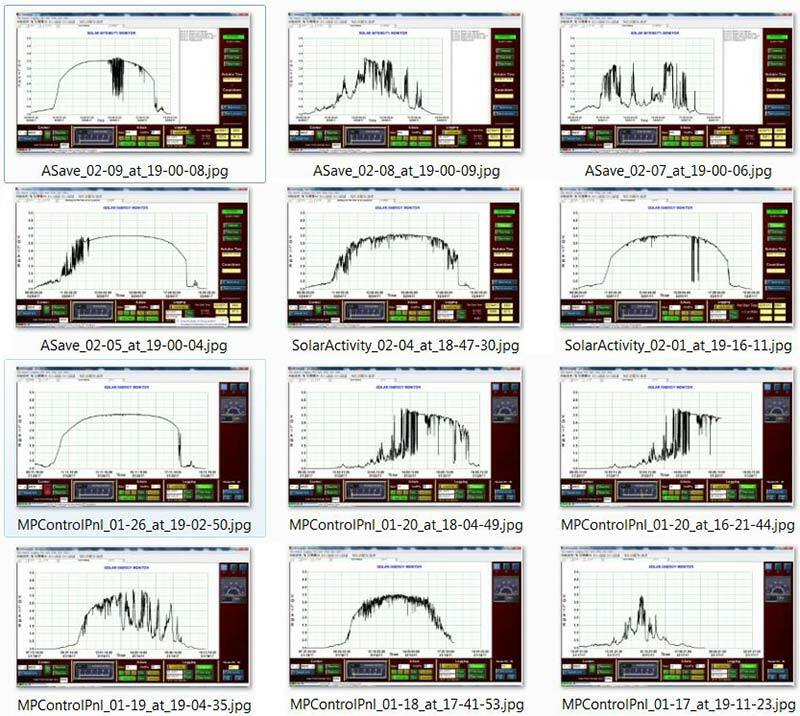 A collection of recently captured sunlight intensity plots. Finally, for reassurance that all is in sync, a display field on the MakerPlot user interface shows what time the Arduino is using so it can be visually checked for agreement with PC time. Please refer to Figure 2. The Arduino Uno microcontroller is mounted in the small black dust cover enclosure near the center of the figure. As most readers will already be familiar with the Uno microcontroller (except for unique project specific aspects), further overview information will not be included here. FIGURE 2. 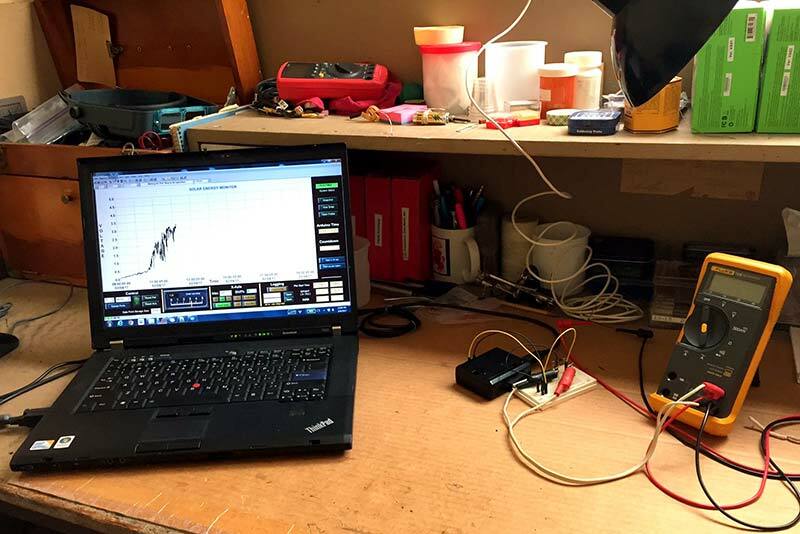 A complete data acquisition system: an Arduino in the black plastic enclosure and MakerPlot on the laptop. The wiring goes to the solar cell in the window. The plugboard (which can be seen in greater detail in Figure 3) serves as a junction box for the various component interconnections required. The white wire with alligator clip connections leads to the solar cell taped to an 8” x 12” piece of cardboard which is propped against a sunny window pane above the workbench. A duplicate of the window mounted solar cell is included in the photo. FIGURE 3. Plugboard junction box, Arduino Uno, and duplicate of window mounted solar cell. 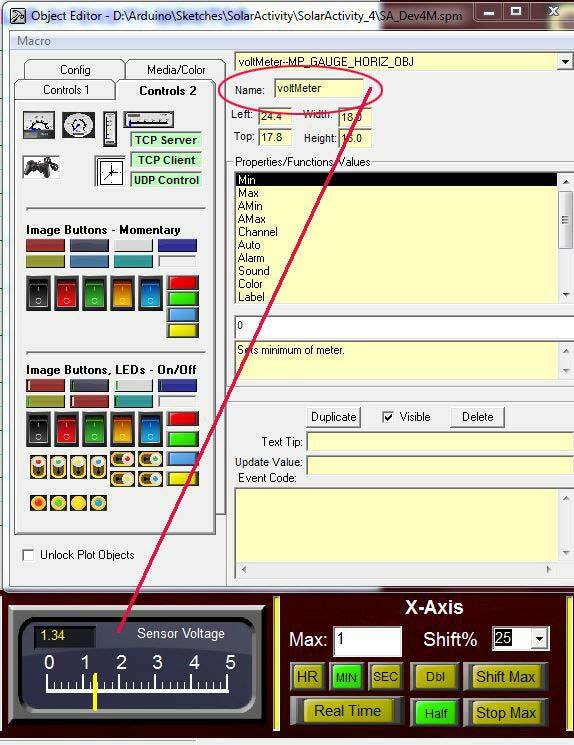 The DVM (digital voltmeter) is not required, but you should check to see that your solar cell’s output stays under the Arduino’s analog input max voltage spec of 5 VDC when exposed to maximum levels of sunlIght before connecting it to the Uno. 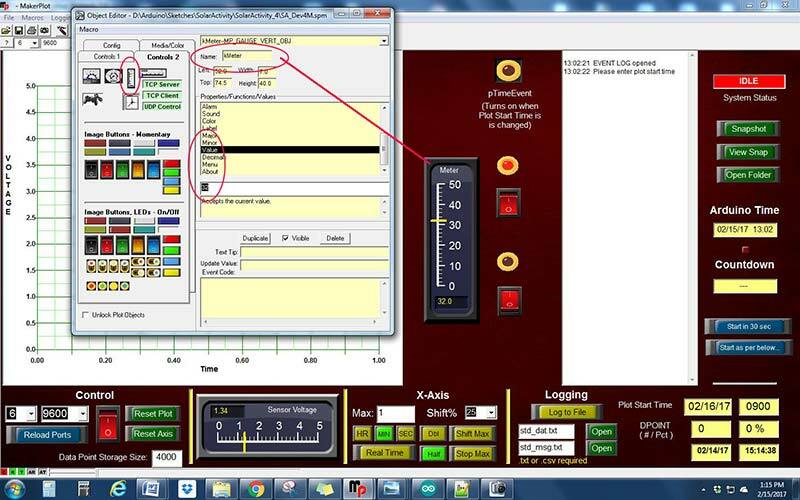 The MakerPlot user interface runs on any Windows based PC and will be discussed further in the next section. Component interconnections are very simple (Figure 4). The 100 ohm load resistor is not absolutely necessary, but its presence will result in an overall lower impedance circuit. We will therefore gain higher noise immunity. As mentioned, MakerPlot is a collection of control components such as meters, switches, input/output text fields, data plots, and the like which you can place and size as desired on your display screen. MakerPlot replaces the text based serial monitor that is part of the Arduino IDE (integrated development environment) with something much more colorful and visually interesting. 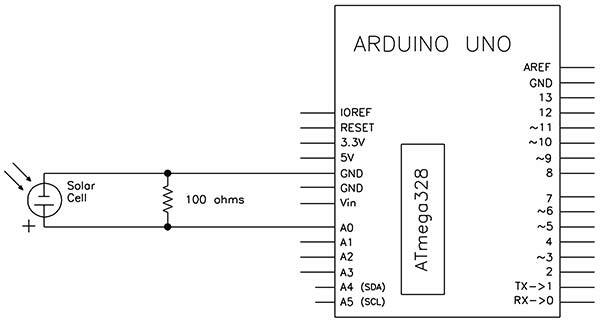 The Arduino and the PC communicate using serial ASCII data over the same USB cable link that is used by the standard Arduino IDE to download a new program into the microcontroller module. No physical cables need to be switched to use MakerPlot; just be aware that you can only do one of two tasks at a time: either display MakerPlot app data or download code to the Arduino controller. This is the same constraint as when using just the Arduino IDE; sharing the data link between program downloads to the controller and displaying data on the serial monitor. You can do one or the other, but not both. Because your PC’s clock is almost certainly synced with an Internet Time Service (or could be), you now have an excellent real time capable data acquisition and control system at your fingertips! 4. Click the red CONNECT rocker switch at the lower left to give the Arduino/MakerPlot communications link to MakerPlot, which will then establish a connection to the Arduino Uno and cause your sketch’s setup() code to run. You should see the Arduino time field update after a few seconds, and the system state should show IDLE. 5. The Event Log will open to the right of the plot, and prompt you to enter a plot start time. 7. In a few seconds, the system state will change to COUNTDOWN and you should soon see the countdown time field begin updating. 9. When the plot reaches the right margin, plotting will stop. 10. Click the green “Open Folder” button. You should be able to see a screen capture snapshot of your recently made plot there. 11. Click the now green CONNECT switch again to turn it red and disconnect MakerPlot from the microcontroller; thus relinquishing the link back to the Arduino IDE. 12. To repeat, wait about 10 sec, click the now red CONNECT switch turning it green. This will also have the same effect on the microcontroller as pressing the reset switch. The Arduino program will restart and run the setup() code again. If desired, enter a new plot start day and time, then click one of the two blue buttons and walk away. You’re done! 13. To abort at any point, click the green CONNECT switch, turning it red and disconnecting MakerPlot from the Arduino. Source comments were freely applied throughout the Arduino code listings. If your intent is a more thorough understanding of this implementation or to go on and generate your own tailored version, spending time looking through the source code would be rewarding. A few key aspects thought to merit additional emphasis are highlighted next. Most of the comments offered here are directed toward the reader intending to modify and enhance our sunlight intensity monitoring project, targeting his or her own new but similar application. F-Macro: The F-Macro has nothing to do with Arduino/MakerPlot coding technique, but you will see it in the example code that will follow shortly. The need for the F-Macro is related to how the Arduino compiler handles memory assignment for literal data. See the F-Macro sidebar for more information. Arduino old timers will be familiar with the F-Macro. Newcomers may benefit from this short explanation. The best use of valuable SRAM memory is for the storage of local variables. The problem is that the Arduino compiler stores literal strings ("This is a literal strIng") in SRAM, which is a waste of a scarce resource. Literal strings don't even change! When SRAM usage gets up to 80% or so, hard-to-find program bugs can really ruin your day! 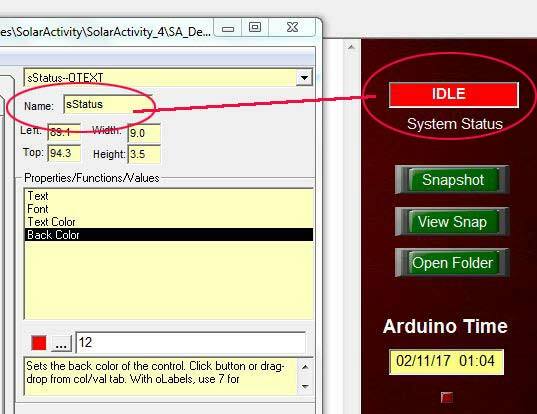 Watch the compilation report text on the Arduino IDE after a successful compile, and download to see how you are doing with these critical resources. Program memory and SRAM usage are both reported there. When I first started developing the solar intensity monitoring software, I was not using the F-Macro, and SRAM usage got up as high as 73%. However, at this point, the project was only about halfway done with the development work! To relieve this situation, I edited in the F-Macro wherever I could, and SRAM usage dropped to 25%. Now with the development work mostly complete, SRAM usage is only at about 30%. Command Termination: Arduinos and MakerPlot communicate with short ASCII messages (command strings) which must be formatted as a single text string and terminated with a carriage return. In building a lengthy command string with several substrings and print statements, this means that only the last one should be Serial.println(). Other previous substrings will use Serial.print(). See the example shown under Plot Grid. Example of Arduino sending an update to a MakerPlot Control object: For instance, updating a meter to move its pointer from its current position to “74” on the meter scale, or to display a switch in the ON rather than OFF position. The meter shown in Figure 7 is typical. In this case, the object name voltmeter was manually assigned, but if the developer chooses not to assign one, MakerPlot will assign its own unique identifier. FIGURE 7. This meter is a typical MakerPlot control object. Each has a set of object properties and a unique name. The four numeric coordinates (Left, Top, Width, and Height) can be manually changed, but it is more likely you will use your mouse to move and resize the object. Select one of these four fields with a mouse-click first; then use the arrow keys to move or resize the object. Note the use of print() vs. println() in the last line above. Very important! Another example of MakerPlot object update coding is the fragment below where the red IDLE status text display (Figure 8) is updated to instead show a blue COUNTDOWN system state indication. FIGURE 8. A simple text box shows which of the machine's four states (IDLE, COUNTDOWN, PLOTTING, STOPPED) is current. This is very similar to the voltmeter example above. A little simpler perhaps since no variable like voltage in the previous example is involved. It is all static data! Serial.print(v1); Serial.print(“,”); // building comma separated string<br /> Serial.print(v2); Serial.print(“,”); <br /> Serial.print(v3); Serial.print(“,”); <br /> Serial.println(v4); // println on ONLY the last one! Receiving data from MakerPlot: We have looked at example code for sending commands (e.g., !PLOT ON) to MakerPlot and also for sending updates to a MakerPlot object (!POBJ sStatus.Text = COUNTDOWN). MakerPlot always has the current date and time available (as determined by the PC’s clock) in its DATE and RTIME variables. So, you would ask it to send the current values (already formatted as mm/dd/yy and hh:mm:ss strings) back using the MakerPlot !SEND or !READ commands as shown in the following code fragment. FIGURE 9. Temporary test of Arduino current date and time display in two unused spare user interface text boxes. Note, however, that you will only infrequently request time related data from the PC via MakerPlot; for example, when you are originally setting or later syncing the Time library clock. 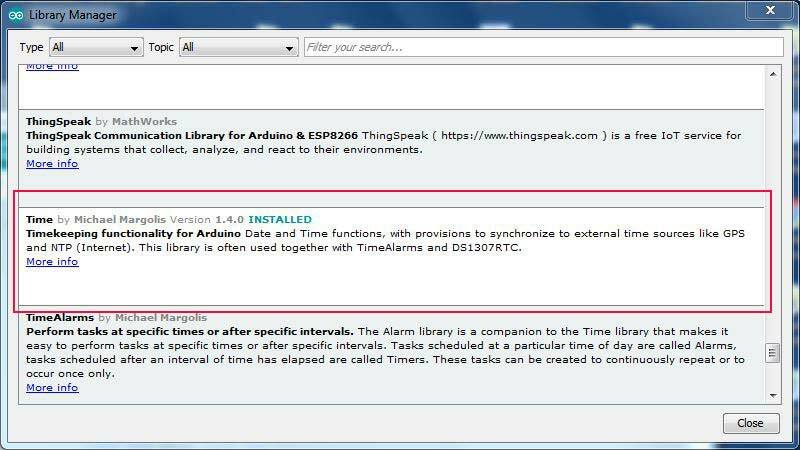 Most of the time, if you want current-instant data, you should instead use the library hour(), minute(), second(), etc., functions to get the desired data relying on sufficiently frequent PC/Arduino sync activity to ensure that this locally-maintained software clock time data is accurate. As you can see, we first ask MakerPlot to send the PC’s current date string (mm/dd/yy), parse it for month, day, and year, converting from ASCII to integer at the same time. Then, we do the same for the time (hh:mm:ss) string. Finally, we call the Time library setTime() function to actually set (or update) the software clock. Persistent Offered Start Time: I wanted to make it as easy as possible to arm the system for countdown to the next plot start time. You can enter any future date and time you like. However, tomorrow’s date with the start-time equal to the previous start-time entered is offered as the default subject to your edits. Make your desired changes to the date and time first, then click the blue Start as per below... button. The Arduino startup() function increments today’s date by one day, and posts it to the plot start time date entry field at the lower right. It also retrieves the previously used start time from the Uno’s EEPROM and restores it to the start time field. The need for flushBuffer(): Misinterpretation of data and commands in the serial communications queue between the Arduino and MakerPlot can happen. You must ensure that the queue is empty before the Arduino initiates a transaction. That is the reason for the frequent use of flushBuffer() that you see in these examples and in the downloaded source code. See page 108 in the MakerPlot User’s Guide for more information. It is possible to start from scratch and build your own user display utilizing MakerPlot control objects, but I don’t recommend starting there. Consider that an .spm file is to MakerPlot like an .xls file is to Excel (or like a .doc file is to Word). It is the data file that MakerPlot uses to build the control surface display you see on your screen. The .spm file is an ASCII text file and can be examined with Notepad. All of the MakerPlot example user interface screens can be found at C:\Program Files\MakerPlot\Macro \interfaces as .spm files. To use one of them as a starting point for your personalized display, go there and copy (for example) the mp_alarming_meters.spm file to your normal Arduino work area. You should rename it also, but make sure you keep the .spm file extension. I suggest you put it in a MakerPlot folder under your Arduino folder. Double-click your copy of the file and it will open in MakerPlot. To free up a small work area, reduce the size of the plot grid. Open the Object editor (second button from the right on the toolbar) and set the Plot Percent to 50% in the X direction and 80% in the Y direction (Figures 10 and 11). FIGURE 10. Uncover a hidden experimental area behind the plot grid. FIGURE 11. 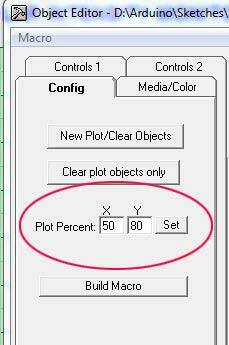 Shrink the plot grid to make room for more control objects. 1. Drag a control (e.g, a meter) from the Controls 1 or Controls 2 tab of the Object Editor to the recently freed area of the display. 2. Once in place, shift-right-click to select it. Click the left field in the Object Editor; then use the arrow keys and shift-arrow keys to experiment moving the object. 3. In a similar manner, select the Height field and use the arrow keys again this time to resize the object. 4. Give your control a more memorable name than the one assigned by MakerPlot. Don’t forget to hit ENTER to terminate your entry. A. In the Object Editor — assuming your test object is a meter — select the value property and try entering a few different values to see it animate. C. We’re on a roll! Let’s try to write a simple sketch to ramp the meter up and down. Put the following code in the setup() section of a new sketch and leave loop() empty. 6. Save your work! If you make any additions or changes to your user interface (.spm file) that you want to keep, YOU MUST EXPRESSLY SAVE your work before closing MakerPlot. A. Open the Macro Builder by clicking the last toolbar button on the right (wrench symbol). B. Some of your changes at this point exist only in memory. You must also click the wrench symbol at the top of this Macro Builder window to rebuild the macro prior to saving it. C. Now, click the DOWN ARROW button and complete SAVE AS to your hard drive (Figure 12). FIGURE 12. 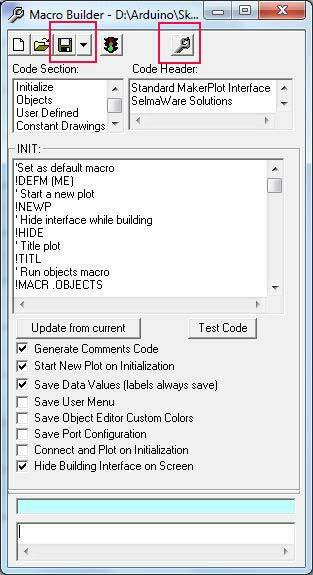 Save a copy of your recent user interface display changes with the Macro Builder control panel. D. In the future, double-click this new .spm file to start MakerPlot. You will find all of your previously made changes in place when it opens. 7. At some point, you will want to delete some of the original control objects from the starter example screen to make room for new ones of your own choice. I have found that most of the groups of controls across the bottom of the mp_alarming_meters.spm interface display are quite useful. I try to leave them in place across the bottom, and use the right side for my specific control objects. Shrink the plot grid to make more space if necessary using the Object Editor Plot Percent configuration fields mentioned earlier. Log(Debug/Immediate) Window: Unfortunately, you still have to write special debug code yourself when needed, but MakerPlot’s separate Log/Debug window is very helpful to watch debug variables as the program runs, helping you track down inevitable bugs. You already saw one way previously to use this window in the immediate mode (Step #5b above) to simulate commands from the Arduino code and see if MakerPlot reacts as you expect. In that scenario, whatever you type is immediately acted on by MakerPlot. More ambitious debug listings are also possible. Perhaps something that displays an ASCII string in hex format. As you might have guessed from the eight checkboxes along the bottom of the debug window, you can eavesdrop on a subset or essentially all Arduino/MakerPlot communication messages. This is an immense help in debugging the type of errors that might arise from development efforts in this and similar projects. Typical output would be similar to that shown in Figure 13. FIGURE 13. The Log (Debug/Immediate) window is helpful in development activity. 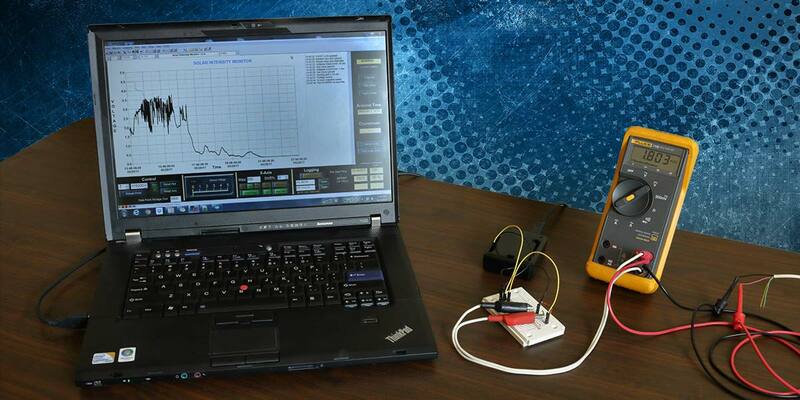 Use it to display debug variables or to test proposed Arduino command formats to MakerPlot. It is also possible to limit the display of debug messages to only those containing a target text string entered into the filter text box at the bottom of the window (not visible in the figure). This simple project actually ignores a lot of MakerPlot’s capability. It is aimed at the reader who is interested in how Arduino code and MakerPlot functionality can interact, and what the result might look like in the context of a simple working project. If you are serious about applying these techniques to future microcontroller projects, the next step is to spend some time with the rather hefty MakerPlot User’s Guide! MakerPlot is described by the manufacturer as a “Data Acquisition and Graphical Plotting Software Package for Microcontrollers.” A free 306 page user guide and a free 30 day trial installation is available, as well as a discount for Nuts & Volts readers who decide to purchase MakerPlot at https://store.nutsvolts.com/books/sku17212. Nuts & Volts published a 10-part series of articles on MakerPlot between October 2013 and July 2014 (“MakerPlot — The DIY Software Kit,” by John Gavlik and Martin Hebel). If you have a Preferred Subscriber Network subscription to Nuts & Volts, you already have digital access to these archived issues. Or, you can purchase individual back issues at the Nuts & Volts web store at www.nutsvolts.com. 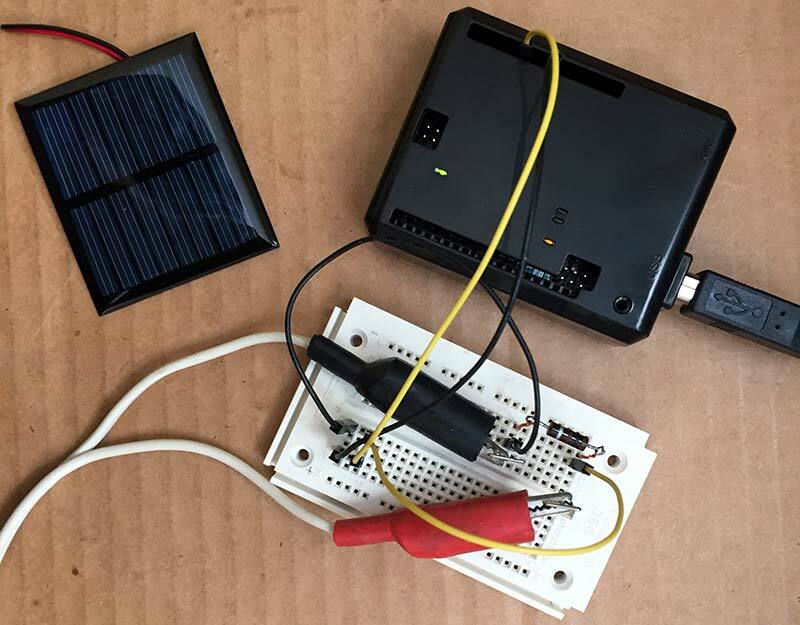 The solar cell used in this project was part of a small solar USB charger kit available from KipKay Kits. However, there is no need to purchase the entire kit just for the tiny solar cell included in it. Any small solar cell should work; perhaps with the addition of a small two-resistor voltage divider if the cell’s rated output is greater than the 5V max of an Arduino analog input. The 4.2 volt cell (PN 228030) available from Jameco Electronics should work fine.